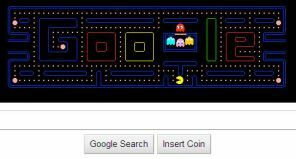 On May 21st, Google celebrated the 30th Anniversary of Pac-Man. For those not present in the early 1980’s Pac-Man was a phenomenon that took the world by storm. Arguably the first video game since the invention of the format that created a pop-culture frenzy. Pac-Man machines were all the rage, everything from traditional arcade machines, to cocktail table machines, and even home machines modeled after the arcade model and even appearing on popular home gaming consoles at the time like the Atari 2600. Pac-Man was hitting pop culture by storm, appearing everywhere such as t-shirts, lunchboxes, board games, toys, and several incarnations in the arcade including the very popular Ms. Pac-Man. The popularity even spawned the creation of a Saturday morning cartoon series based on the game. If people were excited about Pong, the first video game, Pac-Man was the equivalent of Beatlemania taking it to a whole new level. Pac-Man was so popular it even inspired a song entitled “Pac-Man Fever” by Buckner & Garcia and it even incorporated sounds from the popular video game. If you’re interested in hearing the song, I’ve included a YouTube clip containing the song at the end of this blog entry. As Google likes to transform their logo on the search engine site from time to time to mark significant anniversaries, the marking of Pac-Man’s 30th Anniversary was not left unnoticed as the Google Logo was transformed into the walls of Pac-Man’s maze and for the first time ever became Google’s first playable “doodle” image. All 256 levels of the original Pac-Man game were created in the playable image for those Pac-Man masters who’ve mastered the game. To play, the usual button on Google that normally says “I Feel Lucky” has been replaced with a button that says “Insert Coin” which activates the game, or if you wait a few seconds the game starts automatically. While originally meant to last for just a couple of days, the popularity of the interactive Google version of Pac-Man led Google to announce the game has earned a permanent home on the Google site and can be accessed at any time by visiting Google.com/Pacman. I opted to celebrate the anniversary of Pac-Man by wearing my Pac-Man face t-shirt I bought a couple of years ago. I don’t usually wear it because I find the yellow to be a bit to bright, but for a special day to celebrate an icon of the 1980’s, I was more than happy to put it on. I also took advantage of the sale the iTunes app store had on the Pac-Man games. For some reason the original Pac-Man was only discounted by $1 to a price of $3.99 while all the other Pac-Man variations including Ms. Pac-Man were discounted to a price of 99 cents. So I just bought Ms. Pac-Man, which ultimately was a better Pac-Man game because the mazes changed unlike the original Pac-Man.